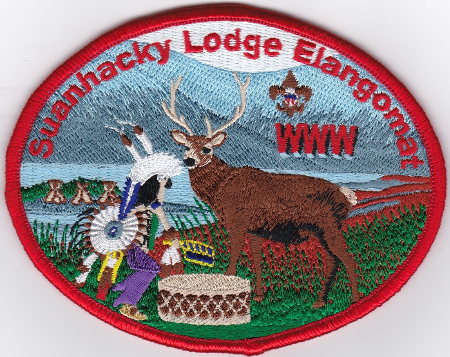 Four years ago, I was posting about one of the final issues from Suanhacky Lodge #49, one of a series of 4 patches they put out for their ceremonial teams. The Grey or Silver bordered version pictured below is for adult members who performed on one of the Ceremony Teams as a youth. The scanner washes out the border color a bit, but it is grey or silver in color. Anyone have one of these available for trade or sale? 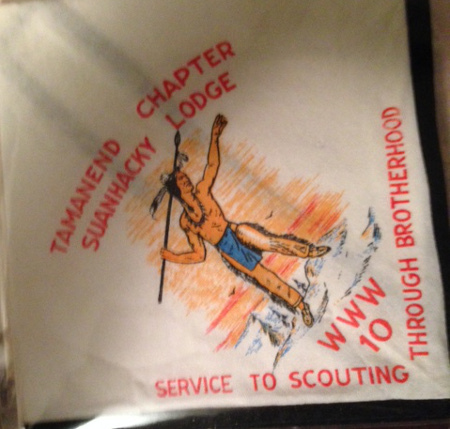 Down at the bottom of one of my piles of to be scanned items was this bolo from Suanhacky Lodge #49. The style and coloring are reminiscent of one of their early solids, the S2. Not sure of the time frame, but I suspect this is from the 1980’s. Can anyone confirm the year of issue? 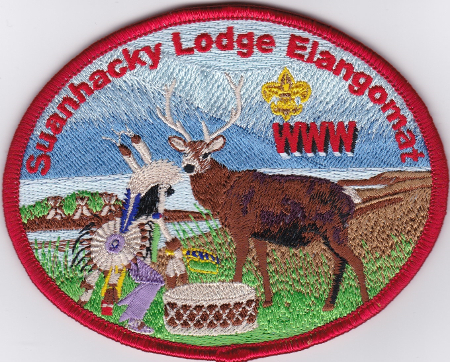 Thirteen years ago, I had written about a new Suanhacky Lodge #49 Elangomat Patch. While at the TOR last weekend hosted by Lenapehoking Lodge #9 which turned out to be a new version of the X30 patch which I am calling the X55 which was probably issued circa 2012 and obtained from the old Lodge Advisor. The X30 is from circa 2005 has a dark green grass, Brown FDL with RWB shield, Blue Fan in Indians hand and Blue ground middle left, Blue rosette in bustle, reddish brown ground at right, white sky behind Lodge. 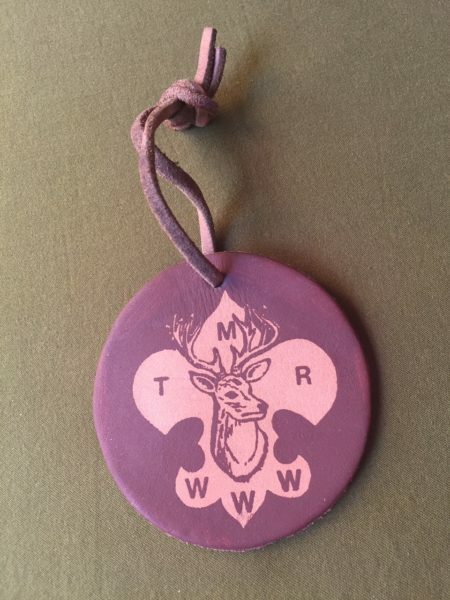 the X55 from the TOR (probably issued circa 2012), has a light green grass, yellow FDL with Tan highlights, Green bottom to Fan in Indians hand and Brown ground middle left, Purple rosette in bustle, light brown ground at right, light blue sky behind Lodge. Gene Berman had a neckerchief he had recently acquired he was unsure of the provenance. A little research by Ian Pinnavaia revealed that it was from an old Troop Honor Society located in Queens, NY. As a Scout in Troop 273, there were two honor societies where one could earn membership. 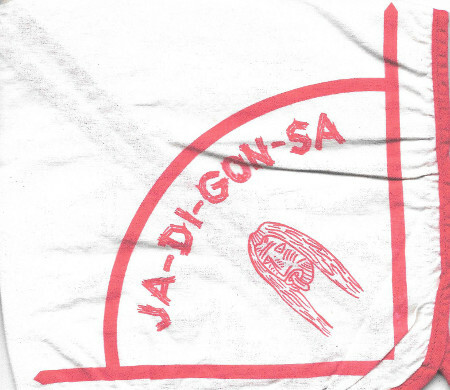 The first was a local Troop honor society: Ja Di Gon Sa. The second was the Boy Scout’s national honor society: Order of the Arrow (OA). Troop 273 was unusual in that most Troops did not have their own local honor society. Gene Berman sent along word of a previously unlisted variation of a Suanhacky Lodge #49 Tamanend Chapter N1 variation. I had checked this one off as a need since I had one in my collection, which we will now call the N1a. and I added Orange Background. Tamanend N1a DBR P WHT RED SSC, Orange Indian & background. 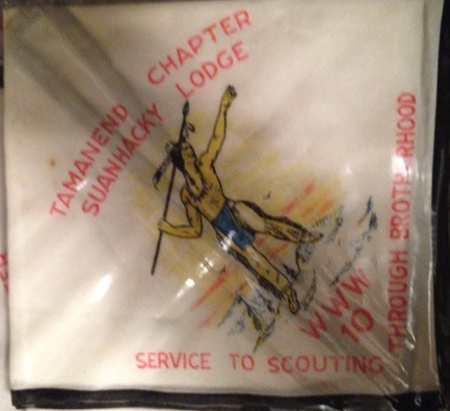 I picked up what I thought was a duplicate Tamanend Chapter neckerchief on Ebay and was surprised to see the Indian was a different color (orange versus yellow) then the one I already had. I would guess they were ordered twice since they are professionally made which to me is different than the home made things that by their nature will vary. and I added Yellow Background. Tamanend N1b DBR P WHT RED SSC, Yellow Indian & background. I need the yellow if anyone has one for trade or sale. 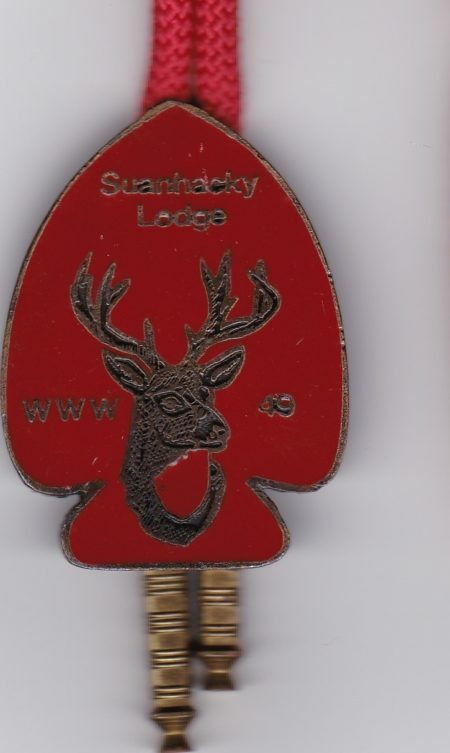 seems to be the time for discoveries, yesterday I listed one from Ganeodiyo Lodge #417 which went back to 2005; today is one from Suanhacky Lodge #49 which dates back to 1981. 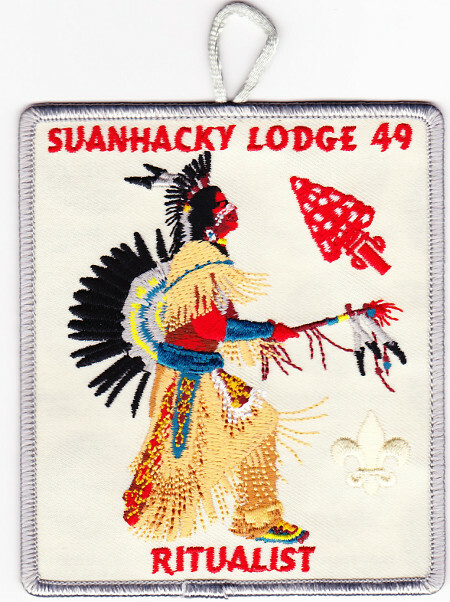 Gene Berman and Johannes Knoops shared an image of a Leather patch issued by Sunahacky Lodge #49 when they were the host lodge for the 1981 NE-3A Conclave. Five years ago we were writing about a new issue from Suanhacky Lodge #49, the X45. 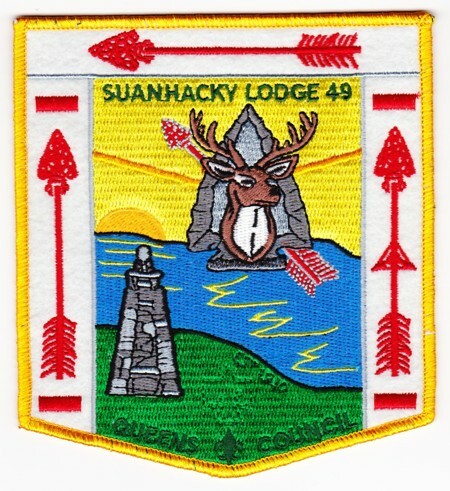 Suanhacky Lodge #49 recently issued a limited patch, a gold bordered chevron, sporting the OBV sashes on white felt and a view of the Tower of Friendship overlooking Crystal Lake at sunset. There were reportedly 75 patches issues. A green bordered version with a larger run is scheduled to be issued as part of the Honors Weekend in May.